The story of New Orleans begins here. No city celebrates life, or death, quite like New Orleans. Come learn about jazz funerals. Find out why most of our dead are buried above-ground. Hear tales of the famous soldiers, statesmen, musicians, and even Storyville madams who rest in our Cities of the Dead. Our tours are both historically accurate and entertaining. (You can’t make this stuff up!) Most importantly, proceeds from our tours go to preserving our unique cemeteries. Daily | 1.5 hours | Our most popular tour! St. Louis Cemetery No. 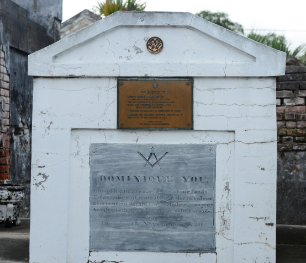 1 is the oldest existing cemetery in New Orleans and the burial ground of both the illustrious and the notorious. Listen to stories about New Orleans first mayor and sugar producer Étienne de Boré, architect of the U.S. Capitol, Benjamin Latrobe, chess champion Paul Morphy, and Homer Plessy of Plessy vs. Ferguson fame. 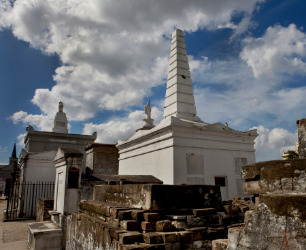 Come visit the tomb of Voodoo Queen Marie Laveau and see the pyramid-shaped future tomb of actor Nicolas Cage who once owned the LaLaurie Mansion, a house of horrors on Royal Street. Tours are 7 days a week at 10 am, 11 am and 1 pm. Adults: $25, Kids 12-18: $15, Kids 6-11: $7, Kids under 6: free, Over 60 and military: $21.25. As subjects of France and Spain, free people of color in Louisiana were allowed to prosper before the Louisiana Purchase, unlike those in other parts of America. Most of them who bought vaults and tombs in St. Louis No. 2 were free before the Civil War. Their tombs are each chapters in a fascinating success story. Come hear tales of black poets, writers, and a skilled swordsman/mathematician. Stand at the final resting places of Reconstruction politicians, officers in the Union Army, devout Catholic nuns, and wealthy black planters. Tour is 1 1/2 hours long and meets at Backatown Coffee Parlour, 301 Basin St. NOLA. Tours are on the first Friday of every month at 10 am. In 1854, when more than 8,000 people in New Orleans succumbed to one of the nation’s worst outbreaks of yellow fever, bodies were just left outside the gates of Lafayette Cemetery No. 1 in the historic Garden District. The tombs inside this old City of the Dead tell tales of yellow fever, apoplexy, death by lightning and more. Tours are seven days per week at 10:30 am and 1 pm. Adults: $20, Kids 12-18: $15, Kids 6-11: $7, Kids under 6: free, Over 60 and military: $17.00. Mon., Wed., Thurs., Fri. & Sat. | 3 hours | Two Tours in One! On this tour, you’ll get to explore St. Louis No. 1 as well as St. Louis Cemetery No. 2. Both cemeteries are included on the National Register of Historic Places and the Louisiana African American Heritage Trail. St. Louis No. 2 is the final resting place of famous jazz musician Danny Barker whose work with the Fairview Baptist Church Brass Band helped to ensure the longevity of jazz in New Orleans. You can also visit the tombs of Ernie “Mother-In-Law” K-Doe as well as Andre Cailloux, African-American Union hero and martyr of the American Civil War. Tours are Mondays, Wednesdays, Fridays, and Saturdays at 9:30 am. Adults: $40, Kids 12-18: $20, Kids 6-11: $10, Kids under 6: free, Over 60 and military: $34.00. 1st Sunday | 1.5 hours | One of NOLA's largest cemeteries! 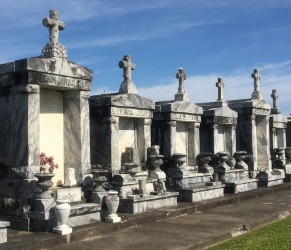 One of the city’s most stunning Cities of the Dead is Metairie Cemetery, named by Forbes as one of ten of “America’s Best Cemeteries.” The cemetery was established in 1872 on a former racetrack, which is why the cemetery follows an oval layout. 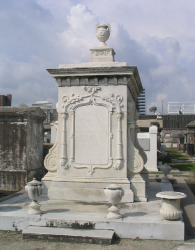 Metairie Cemetery holds the graves of over 9,000 people, including at least nine Louisiana governors, seven New Orleans mayors, 49 kings of Carnival, and three Confederate generals. Bandleaders Louis Prima and Al Hirt, restauranteurs Al Copeland and Ruth Fertel, and former Saints and Pelicans’ owner Tom Benson are also interred here. Tours are on the first Sunday of every month at 10:00 am or by appointment (call SOC for assistance). Just a short walk from City Park is St. Louis Cemetery No.3, on stately Esplanade Avenue. A fairly modern “City of the Dead” by New Orleans standards (it only goes back to 1848), this beautiful Catholic cemetery near tranquil Bayou St. John was a former graveyard for victims of leprosy. 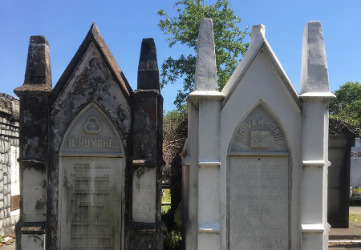 Today it is an ideal place to view tombs, learn about yellow fever epidemics and New Orleans’ burial customs, and hear the stories of the famous entombed here. St. Louis No. is the final resting place of architect James Gallier, ragtime composer Paul Sarebresole, Storyville photographer E. J. Bellocq, abstract painter Ralston Crawford, self-taught jazz pianist and singer Sweet Emma Barrett and Chef Paul Prudhomme. 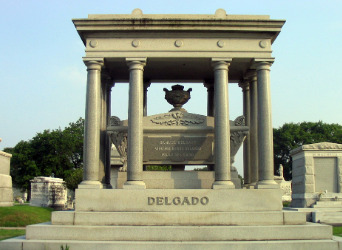 You’ll find the tombs of restauranteurs Galatoire and Tujague here as well. Tours are on the every Thursday at 9:30 am. 4th Saturday | Ages 15+ | 3 hours | Most unique experience! Why just go on a tour when you can have an exclusive experience? 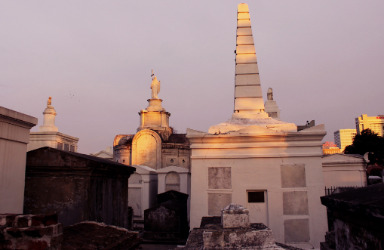 Come see what is the final resting place of voodoo queen Marie Laveau and others at twilight, when shadows lurk and the imagination can go into overdrive. After the tour, enjoy a complimentary cocktail and appetizer at the Batch Lounge at the Hyatt Centric Hotel with your guide. This evening cemetery tour is held on the fourth Saturday of each month unless otherwise noted. Advance reservations are required. Reservations must be made at least 24 hours in advance of each tour. You must be 15 and over to take this tour. Adults: $50, Ages 15-20: $30, Over 60 and military: $42.50. Discounted valet parking is available at The Hyatt Centric at the rate of $15.00. Limited on-street parking is also available. Total event time: 3 hours (cemetery tour lasts approximately 75-90 minutes). Tours typically last one and a half hours. Please allow at least two hours to take our tours. All tours leave on-time, rain or shine. Please arrive at least 15 minutes before the tour begins, as our tour guides start their tours promptly at the scheduled times. Tip: DO NOT rely on the streetcars (trolleys) to run on time. You may be late and/or miss the tour. Suggested items to bring: bottled water, sunscreen, comfortable shoes, hats, umbrellas (to protect from rain and provide shade). When touring St. Louis Cemetery No. 1, you are required to stay with your tour group at all times. Leaving your group is strictly prohibited by New Orleans Catholic Cemeteries, the owner/operator of St. Louis Cemetery No. 1. Please reserve your spot in advance. In busy months, tours can fill up quickly. On the other hand, if no one is signed up or there are less than 5 people signed up, the tour will be canceled. If you are booking online please reserve at least two hours before the tour begins. Otherwise, call 504-525-3377 to book. Marking a tomb is an act of vandalism and desecration of a grave site. In addition to breaking the law and causing physical damage, the vandalism of any tomb or gravesite is extremely disrespectful to the families associated with the tomb and to the deceased themselves. Marking and scratching into the stucco causes permanent damage to the exterior and increases the structural vulnerability of a tomb. Removing brick pieces from other tombs to use as markers can completely destroy what is left of an already crumbling tomb. SOC asks that if you see vandalism occurring in any of the cemeteries, please photograph the tomb if possible and contact SOC and/or the cemetery owner/operators to report the activity.